The internet is full of articles claiming to transform the reader into the Social Media equivalent of Charles Atlas. I have written some of them myself (though hopefully while highlighting that that things are seldom as simple as ticking a set of boxes). Bearing in mind the old adage that you learn more from your mistakes than your successes, here are some thoughts on Social Media failures; the first three are mine and the fourth a failure that seems very widespread. Lest this article becomes too depressing, I will close with a more positive piece of Social Media news. I’ve been doing this every day for about 2 years now. Some of the growth that I’m seeing is due to just plugging away and forcing myself to blog every day, hopefully creating good, relevant content that people want to read. If I take a day off, I notice a drop in traffic. In fact, I always see a drop in my November traffic because I go away for Thanksgiving to an area with no Internet access. 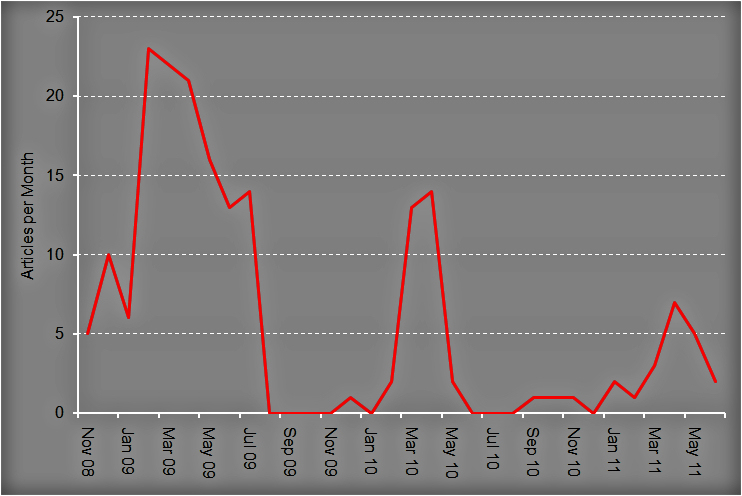 A quick look at the above chart, which shows the number of articles I have published each month since founding this blog back in November 2008, will reveal that consistency hasn’t been my middle name. For a variety of reasons, I have had periods where I have sustained a high output of articles (without, it is to be hoped, quantity compromising quality) and periods where my writing has slowed to a barely perceptible trickle. To take an ultra-prosaic example, I started writing this piece while commuting by train and my recent output is highly correlated with my method of transportation. Coming out of some of the troughs in writing, I have sometimes felt that I could simply pick up where I left off. This is probably the case with some niche readers who may visit this site; this is precisely because at least some of my content is directly pertinent to them from time to time. However, after a while, even they may have looked elsewhere for their regular fix of the topics I cover here. Beyond this, there is equally likely to be a second cohort of casual readers who will quickly move on to pastures new if the grass here does not re-grow apace [note to self, I am meant to be restraining myself from overly liberal use of analogies, must try harder!]. Even if an author has written several articles that have proved popular with a number of people; after anything more than a few weeks’ lay-off, it can almost be like starting again from scratch. To employ a too widely-used phrase, you are only as good as your last month’s (or maybe week’s, or maybe day’s) output. Disregarding for the moment my own parenthetic advice from the end of the paragraph before last, this feels rather familiar. It seems to be very like what it feels like trying to get fit again after an injury or time away from a sport. It doesn’t really matter if you had attained a certain level of fitness a year ago; what is relevant today is your current level of fitness and the gap between the two. Sometimes recalling just how long it took them to achieve a previous standard can be quite de-motivating to an athlete returning from a break. Once fit, it is a lot easier to stay fit than is is to regain lost fitness. The same applies to audiences and this is why – as Kevin suggests in his article – at least periodic blogging (assuming that it is of a standard) is essential. My learning here is both to make time to write and also to re-engage with my readers. I have a specific example in mind here and it relates to a blog post that precedes this one. In turn this goes back to a survey of senior IT people that I carried out predominantly via LinkedIn back in January 2009. This related to their view on the top priorities that they faced in their jobs. Recently I thought that it would be interesting to update this and – no doubt naturally – I also though that I would adopt the same modus operandi; i.e. LinkedIn. I even targeted the same Group – that of CIO Magazine. The output of the last survey was not of much interest / didn’t tell people anything that they didn’t already know and so it was not worth the effort of replying again. The people frequenting the CIO Magazine LinkedIn Group back in 2009 were a very different set of people to now. Back then we were in the aftermath of the global banking crisis and perhaps a number of good people had more time on their hands than would normally be the case. Today, while the good times are not exactly rolling, I hope that a large tranche of these people are once more gainfully employed. It could be (as I have mentioned before) that the wild proliferation of LinkedIn groups means that people’s time and energy is spread over a wider set of these, with less time to devote to specific questions. I have no access to LinkedIn statistics, but would like to bet that while overall Group-based activity has no doubt increased, activity per group may well have decreased. Variants of the same question may have been asked so often that people have grown tired of answering it. This could be one of the early signs of general Social Media fatigue. By way of contrast – and perhaps tapping into my thoughts about variants of the same question having been asked many times before – the same Group has a thread asking members to state in one word what their key challenge is. Although many of the replies are somewhat trite and there is a limit to how much information a single word can convey, it is instructive to think that an innovative approach (and one that requires little time typing a response) has been successful where my attempt to repeat a previous exercise has failed. My learning here is to think of new ways to approach old material, rather than simply believing that your can repeat past successes. I religiously refrain from blogging about current work projects, however the following was 100% in the public domain of its very nature. I have recently been doing some recruitment and – given both the increasing use of LinkedIn by recruitment firms in their work and that I have a pretty extensive network – thought that it would be worth trying to leverage Social Media to reach out to potential candidates. I did this via a status update, rather than taking the perhaps more obvious path of using the various job sections. My logic here was that I would potentially reach a wider audience in one go than via several postings within pertinent groups. I was also pursuing my recruitment through more traditional channels, so this idea could simply be viewed as a Social Media experiment. As with any honest scientist, it is important that I state my negative results as well as positive. In this case, though I was contacted by many recruitment agencies, I didn’t get any feedback from actual candidates themselves at all. It could be argued that the failure was in the way I approached the experiment, or the narrowness of the channel that I selected. While both of these are true observations, the whole point of Social Media in business (if there is one) is to make either organisation-to-person, or person-to-person contact ridiculously easy and immediate. Regardless of my level of ineptitude, it wasn’t easy to achieve what I wanted to achieve and I abandoned my experiment after a week or so. My learning here is to not to refrain from business / Social Media experimentation, but not to expect too much from what is after all an emerging area. I have often used this column to talk about my opinion that your choice of Business Intelligence tool is one of the least important factors in a BI/DW project. In the article I link to in the previous sentence, I quote from an interview I gave in which I compare the market for BI tools with that for cars. There is no definitive answer to the question “what is the best car?” and in the same way there is no “best BI tool”. Going further than this, there are many other areas of a BI/DW project which, if done well, will come close to guaranteeing your success regardless of which BI tool you select; but, if done badly, will come close to guaranteeing your failure with any BI tool. I still wonder whether Jeff got any e-mails. At least he flagged his connection with Oracle, I don’t recall many other vendor employees being honest enough to do the same. Lest I be accused of bias there were also not too dissimilar postings from people strongly associated with SAP, IBM, QlikTech, Pentaho and a sprinkling of BI start-ups. I should perhaps also note that SAS was not a culprit (at least to date), but then maybe this was because the question was about BI, something they abjure. Microstrategy was also honourably notable for its lack of replies containing naive self-promotion, but perhaps this was simply an oversight. Why do the people making these types of posting think that they will be taken seriously? Why do the vendors themselves not offer better guidance to their employees about avoiding crass and counter-productive social media advertising of a sort that is more likely to tarnish reputations than enhance sales? Maybe here again we have an issue of social media maturity. Many people are perhaps struggling as much to get their message across effectively as they did with say the advent of television advertising. My learning here is that I should curb my rather obsessive compulsion to “out” vendors promoting their own products under the guise of neutral advice-giving. I believe that my elevated ranking is probably correlated to recent changes in Google’s algorithms that take greater account of social media. Certainly I don’t recall placing on the first page for any Google search before, let alone rank #1. I suppose that I might have a degree of technical satisfaction if this was as the result of months of assiduous search engine optimisation. However the truth is that the result appears to be the unintended by-product of doing lots of things that I wanted to do anyway, like writing about topics I am interested in and trying to engage with a wide group of people in a number of different ways. In a sense the fact that this achievement was accidental (or at least collateral) makes it more pleasing. Maybe the secret to Social Media success is simply to not worry about it and just get on with expressing yourself. My learning here is that providing content that is of interest to your target audience and being clear about who you are and what you do is going to be an approach that trumps any more mechanistic approach to SEO. I believe that I have leant something from my three failures above (and that vendors should learn something from the fourth), but the single success encourages me to persevere. My aim in sharing these experiences is to hopefully also similarly encourage other Social Media ingénues like myself. I hope that I have at least partially achieved this. Hey Peter, I’m glad you found my article on blog traffic useful, and thanks for the link. These are some great examples! Peter – I agree that consistency is important – i.e. no dipping in and out of SM – however I’m not convinced everyday is necessary nor in my case practical. Looking forward to your thoughts. I think you are right and that regular is more important than everyday. Great post, Peter. I enjoyed reading this and will be sharing it at some of our upcoming social media workshops at SAS. You ask whether or not it’s a fluke that you’re not seeing SAS schilling products in social media circles. In fact, we’ve made strong efforts to discourage that type of blatent behavior online, because we agree that it’s fruitless. Some of the straight-up marketing slips through on Twitter, to be sure, but in discussion forums where direct questions are asked about solving business problems, we encourage our experts to discuss ways to solve problems, not specific software products. It sounds like a responsible policy on behalf of SAS. To be fair to your competitors, some (but by no means all) of the comments were from their partner communities, which must be rather more difficult to control.